Only 12, 1990 Deep Emerald Green 7-Up Mustangs were converted to Saleens. These Saleen 7up Anniversary Mustangs actually started life at the ford factory as coupes even though their model code is still P44 for Mustang LX convertible. 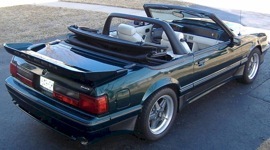 This Deep Emerald Green 1990 Mustang GT Anniversary convertible is owned by Steve Poiry of New Haven, Indiana. Steve says, I have owned the car since October of 2007. Since then I changed the wheels and tires. However, I kept the original wheels and tires as the car only had 4000 miles on it when I bought it. These 35th Anniversary Mustangs are sometimes called a 7-UP car because 30 of these were to be given away by the 7-UP Bottling Company as a promotional item. These cars actually started life at the ford factory as coupes! They were converted to convertibles. This is a Special Edition 1990 Deep Emerald Green Mustang LX convertible. This particular one is sometimes called a 7-UP car because 30 of these were to be given away by the 7-UP Bottling Company as a promotional item. These cars actually started life at the ford factory as coupes! They were converted to convertibles. The work was done by Car & Concepts in St. Louis, Missouri. The 7-Up contest never materialized but 4103 of these special Mustangs were built. 2743 had automatic transmissions and 261 of them were exported out of the country. Deep Emerald Green 1990 Mustang LX 25th Anniversary convertible with a 225hp (at 4200rpm), 302 cubic inch (5.0 liter), electronic fuel injected, high-output, V8 engine. 4103 of these commemorative edition LX convertibles where made with white interiors, color match side molding (standard after 1992), 16-spoke wheels from the GT, the larger E-code V8 engine, and commemorative badges. With less than 5000 miles on this care, it is all original except for a new battery and air filter; these are even the original P225/60VR-15 tires (with a little ArmorAll of course). Here is an unusual one. It's a Deep Emerald Green 1990 Mustang Saleen 7-Up limited edition convertible. Saleen factor serial number 141. Only 12 Deep Emerald Green 7-Up Mustangs were converted to Saleens. The Cobra R hood and black convertible top were added by an owner. Deep Emerald Green was exclusive to these limited edition cars. They were also known as 25th Mustang Anniversary models. These cars actually started life at the ford factory as coupes even though their model code is still P44 for Mustang LX convertible. This Deep Emerald Green 1990 5.0L Mustang LX convertible is a 25th Anniversary limited edition. Also known as the 7-Up Edition, because it was suppose to be a 7-Up promotion as well. Check out the 7-Up license plate. Check out this Black 1990 25th Anniversary 5.0L LX convertible with aftermarket wheels. Many 1989 and 1990 Mustangs were designated as 25th Anniversary Mustangs. Look for the special badge on the dash. This car was photographed at the 2010 Mustang car show in Port Angeles, Washington. It was a little rainy, so the top is up.